« Make Calls From Gmail But Not Google Voice? 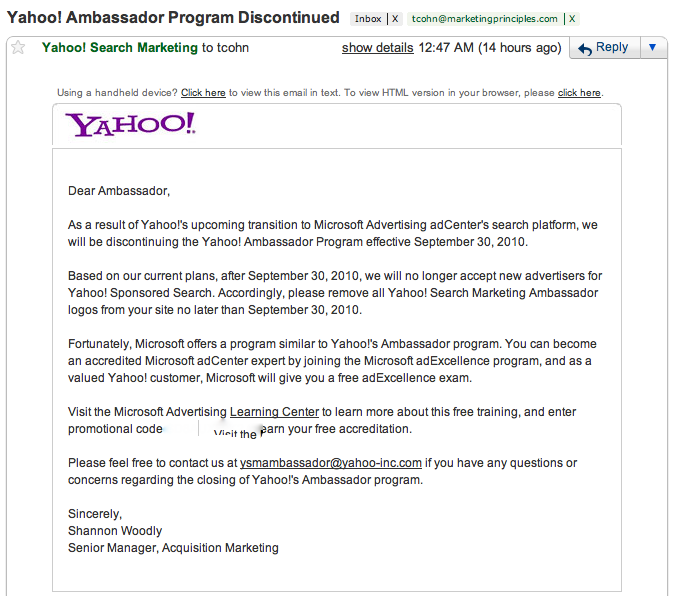 For all you Yahoo Ambassadors out there, it official: Yahoo’s Ambassador program will cease to exist September 30, 2010. Based on our current plans, after September 30, 2010, we will no longer accept new advertisers for Yahoo! Sponsored Search. Accordingly, please remove all Yahoo! Search Marketing Ambassador logos from your site no later than September 30, 2010. Goodbye Yahoo Ambassadors, hello Microsoft adExcellence Members! This entry was posted on September 1, 2010 at 2:33 pm and is filed under Microsoft adCenter, Microsoft adExcellence Member, Yahoo Ambassador Program Officially Discontinued. You can follow any responses to this entry through the RSS 2.0 feed. You can leave a response, or trackback from your own site.